The Internal Revenue Service (IRS) allows taxpayers to take charitable clothing donation deductions on their yearly returns. However, the amount of allowable deduction is not the item's purchase price, but instead its resale price at the time of the donation. Taxpayers are also limited in the amount of maximum deduction they can claim. Tax deductions are different than credits. A deduction is subtracted from the taxpayer's gross income, thereby reducing the amount of money the IRS taxes. A credit is subtracted from the taxpayer's calculated tax liability for the year. Taxpayers do not receive a refund for the amount of their deductions which exceeds their tax liability, but do receive a refund for any credits which exceed their liability. All charitable donations, including those of clothing, are deductions. Charitable donations of clothing fall within the IRS category of "charitable contributions." The rules about which organizations are considered charities, what donations can be deducted on a return and the amount of the deduction are established in IRS Publication 526. The IRS allows deductions for any type of clothing, shoes, outerwear or underwear. The only requirement is that the clothing be in good, usable condition. This rule exists to prohibit taxpayers from making extensive deductions for what is essentially trash. Taxpayers can therefore deduct the cost of clothing that a charitable organization could sell or give to needy individuals without worrying about their usability. It does not require the charity to actually sell the item or make a profit from the sale. As an example, a sweatshirt missing a zipper cannot be deducted, but one with a slightly misshapen zipper can be. 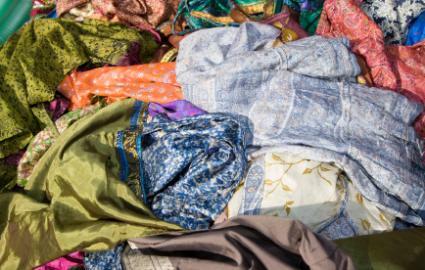 The IRS does not establish specific values for donated clothing. Instead, the agency encourages taxpayers to consider the amount a consignment or used clothing store could charge for the item. This amount is sometimes referred to as the "fair market value" because it considers what a fair seller would charge for the item and a fair buyer would pay. The value is determined as of the date of donation and not the date of the items purchase. Taxpayers are responsible for estimating and claiming the fair market value of their donations. However, single items valued at more than $500 require an official appraisal, with the exception of cars, boats or other large items which are understood as having a high value. Jewelry, fur coats and other expensive, personal items are not excluded from the appraisal requirement. The IRS limits the amount of deduction a taxpayer can claim against their annual gross income. The applicable limit depends on the type and status of the charity to which the taxpayer donated their goods. Donations to churches, the government, educational institution and private foundations are limited to 50 percent of the taxpayer's income. Donations to veterans groups, cemeteries or which were intended for the charity's use and not for resale are limited to 30 percent of the taxpayer's income. Because of their individual value, most taxpayers itemize clothing donations on their tax forms, particularly when their amount exceeds the standard deduction. However, any charitable deduction of more than $500 must be itemized. On IRS Form 1040, itemized clothing donation amounts are included in Schedule A. Deductions exceeding $5,000 must be listed on Section B of IRS Form 8283, titled "Noncash Charitable Contributions." On this form, taxpayers list the name of the charity they donated to and the items they donated. Form 8283 also contains a section for an appraiser to complete, if applicable. Failure to submit this form may result in the IRS disallowing claimed deductions. Although you are entitled to determine the value of the clothing you donated in the last year, remember that your value must be reasonable. To avoid having the IRS void your claims, ensure that you complete the proper forms and attach any necessary documentation of your donations.